The following Q & A is designed to provide general information about the program. Answers may vary depending on specific circumstances. If you or someone you know is applying for a commutation, it’s important to understand what a commutation of sentence is, who is eligible to apply and the application process. 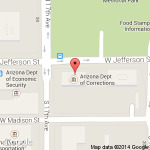 A commutation is one of the three types of clemency hearings conducted by the Arizona's Board of Executive Clemency. The other two types of hearings are pardons and reprieves. Clemency is considered an act of mercy by the leader of the executive branch of government (Governor). In considering whether to recommend a commutation to the Governor, a Board member may base their decision on various factors such as compassion, authentic rehabilitation and sincere remorse, as well as statutory requirements. In certain cases, only statutory requirements may be considered. If a majority of the board approves a clemency request, its recommendation is sent to the governor. The Governor makes the final decision. In Arizona, the Governor cannot grant clemency without the Board’s recommendation. The Board has no legal authority to grant a commutation; it can only make a recommendation to the Governor. A commutation is a shortening of a sentence or set of consecutive sentences. For those committing offenses after January 01, 1994, Arizona law provides that the Arizona Board of Executive Clemency “may make recommendations to the governor for commutation of sentence after finding by clear and convincing evidence that the sentence imposed is clearly excessive given the nature of the offense and the record of the offender and that there is a substantial probability that when released the offender will conform the offender's conduct to the requirements of the law (A.R.S. 31-402).” If the majority of the Board votes favorably, then a recommendation for commutation is made to the Governor. The Board is under no statutory requirements as to reasons why it might recommend a commutation if the offense was committed prior to January 01, 1994. There is no appeal to a denial of a commutation of sentence at any stage of the process, and neither the Governor nor the Board is legally required to provide a reason for denial of a recommended commutation. Who is eligible for a commutation of sentence hearing? inmates facing imminent execution may receive a commutation hearing prior to the date of execution. Once an application is completed, what happens to it? Applications must be submitted through the Arizona Department of Corrections (ADC) and are then screened (except category “d”) for eligibility by ADC’s Time Computation Unit. If deemed eligible, it will be transferred to the Board of Executive Clemency and the Board’s staff will compile the necessary information, schedule a hearing date and make required notifications based on statute, including to victim’s or victim’s family, the county attorney and the sentencing judge. Applications submitted under category “a” (listed above) will be first scheduled as a Phase I hearing. The other categories will automatically be scheduled as a Phase II hearing. they have been deemed ineligible based on statutory requirements imposed by the Arizona State Legislature. Why did ADC return the application? after review, it was determined that the inmate was ineligible to apply. What is a phase I commutation hearing? What is a phase II commutation hearing? If an inmate’s commutation request is moved forward to Phase II, a new hearing date will be scheduled, usually within 60 days of Phase I, and all proper notifications will again be made to the statutorily required persons and/or parties. Members incorporate the same information or documents previously reviewed in Phase I but will focus their attention on direct communication with the inmate as well as testimony from those present and wishing to speak. After considering all the facts and testimony, the Board conducts a final vote and will encompass (if applicable) the criteria set forth in A.R.S. 31-402. If a recommendation is not made, the members may include the elements of A.R.S. 31-403 which allows for the Board to extend re-application times for serious offenses (A.R.S. 31-403 applies to offenses committed after January 01, 2006). What happens if the board votes to recommend a commutation of sentence? If the Board recommends commutation, a letter will be drafted by one of the members and sent to the Governor along with all the documents reviewed by members. The letter will incorporate information about the crime, the Board’s discussion, and the members’ reasoning for the recommendation. All the documentation provided to the Board as well as the audio of the hearing will be transmitted with the letter. This should take place no later than 30 days from the hearing date. In the case of an Imminent Danger of Death applicant, a recommendation to the Governor will be transmitted within 7 days from the date of the hearing and vote of the Board. If recommended, when will I hear regarding the governor’s decision? Any recommendation for commutation that is made unanimously by the members present and voting, will be acted upon by the Governor within ninety days from the acknowledge date that the Governor receives the Board’s recommendation. If not acted on within 90 days of date-stamped receipt by the Governor, and the recommendation was made as a result of a unanimous vote of Board members, the recommendation automatically becomes effective. For majority votes made by the Board, the Governor has no specific time frame within which to act. Can an inmate re-apply for a commutation of sentence if denied by the board or governor? Based upon applicable law and type of offense, some inmates may re-apply every three years and some may be restricted to a set number of years according to statute (A.R.S. 31-403) and, in some cases, the Board’s determination if statutorily applicable. What is an Arizona Governor’s pardon? An Arizona Governor’s pardon is the ultimate relief from the penalties and disabilities associated with a criminal conviction. Obtaining a pardon is a distinct achievement and the applicant should demonstrate to the Board of Executive Clemency that they have earned the Governor’s consideration. You will be asked to explain why you are seeking a pardon. It should be more than simply stating that you want to “clear your record.” NOTE: You do not need a Governor's pardon to reclaim your right to vote or obtain gun rights. Your rights MAY BE restored after successfully completing your sentence and applying to the Sentencing Court for a “Restoration of Civil Rights.” To obtain further information or forms, contact or visit the website of the Superior Court’s Clerk of the Court within the county of your conviction. Who can grant a pardon? Only the Governor can grant a pardon, but first it must be reviewed and recommended to the Governor by the Board of Executive Clemency. The Board has the exclusive authority to hear the individual requesting the pardon. If the majority of the Board votes affirmatively, the recommendation will be forwarded to the Governor for a final decision. Following a recommendation from the Board of Executive Clemency, the Governor has complete discretion in deciding whether to grant a pardon. Please note, a pardon is not granted to every person who applies. What are the benefits and limitations of a pardon? Simply put, an Arizona Governor's pardon restores many of the rights of citizenship that someone loses through criminal conviction. This does not include the right to bear arms, unless specifically authorized to do so in the pardon. A pardon sends a very powerful message to society that you have led a useful, productive and law-abiding life following your conviction. Most individuals seek pardons for either personal satisfaction or for professional licensing, bonding or other employment purposes. However, a pardon may not guarantee employment within a sought career field. A Governor’s pardon may enhance your opportunities for employment but DO NOT assume the pardon will make you eligible for employment. If you are considering applying for a pardon in order to obtain a particular type of employment or a license, you should first check with the employer or licensing agency to see if it would be helpful to do so. Does a pardon expunge my criminal conviction? Because a Governor's Pardon doesn't seal or destroy your criminal arrest record, you must still report your criminal arrests and convictions when asked if you have any arrests or convictions. You can, however, state that you have since been pardoned. An Arizona Governor cannot pardon a conviction that you suffered in another state or in federal court. A Governor's pardon doesn't necessarily avoid or prevent immigration issues such as deportation or removal. Who is eligible for a pardon? Anyone convicted of a felony in the State of Arizona can apply for a pardon. The conviction(s) for which the pardon is being requested must be specifically stated. If the applicant is currently incarcerated within the Arizona Department of Corrections, he/she should determine if they are statutorily eligible to apply for a pardon. What does the board consider when determining your application for recommendation to the governor? Reference letters submitted in support of application. Seeking a Governor’s pardon is a lengthy and time consuming process. Applicants may obtain the pardon application and information on line or make a request to the Board of Executive Clemency. Upon receipt of the request, the Board staff will provide you a packet of information detailing the requirements and the application. It is imperative that you read the instructions carefully and obtain all the required supplements. You will not be scheduled for a hearing until all the required documentation has been received. It is imperative that you advise the Board of any changes in address or contact phone numbers. For further information please see the Board’s detailed instructions located on the website at www.azboec.gov and in the application package. If the board votes affirmatively or negatively for a recommendation to the governor, what happens next? If the vote is affirmative, one of the Board members will draft a letter to the Governor requesting consideration that you be granted a pardon. This letter must outline the compelling reasons for the Board’s recommendation. You will receive a copy of this letter. The Governor may respond to this recommendation at any time. There are no designated timeframes. If the Board votes not to recommend a pardon for an applicant or if the governor denies a pardon, the applicant may apply again for a pardon in three (3) years from the date of the Board's decision.